First came the inaugural class of social media platforms: Facebook®, Twitter® and LinkedIn®. 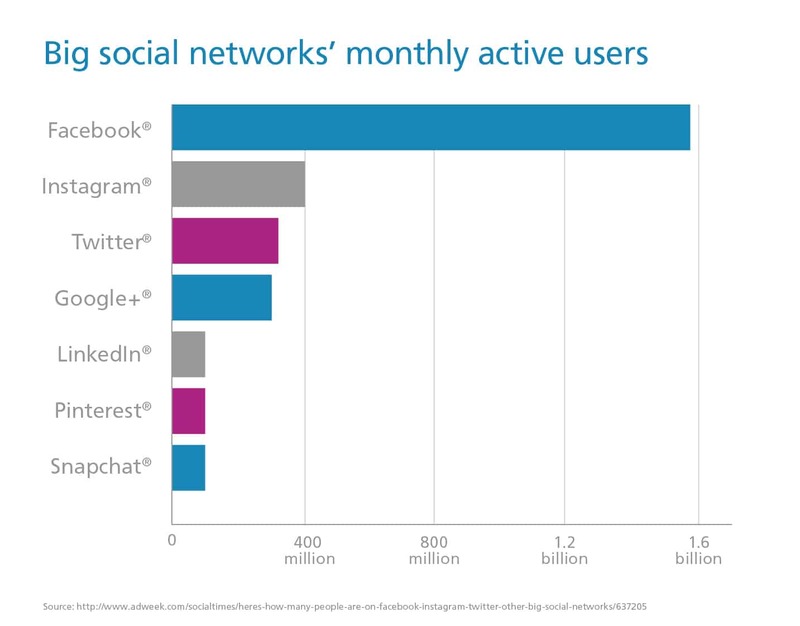 Then came the second wave: Instagram®, Snapchat® and Google+®. Now, there’s an entirely new team of social media players with an ever-evolving list of ways for people to connect, share and promote what matters most to them. From a user perspective, it’s a veritable buffet of delicious options. Choosing is as simple as finding where your friends or professional contacts are or selecting the venues that interest you most. From a company perspective, it’s much more complicated. How do you choose the right social media sites for business? Bottom line: if you’re overwhelmed and don’t know which platforms to choose, we can help. The truth is, social media for companies isn’t negotiable anymore—it’s almost an expectation and an issue of legitimacy and sustainability. Businesses that don’t have a social media presence are missing opportunities to engage key stakeholders, customers and employees, and are ignoring a potentially powerful pipeline for sales conversions and future success. But where do you start? And more importantly, where do you draw the line? Whether you work at a large company, or are seeking social media for small businesses, consider your budget. Resources often require businesses to focus their social media efforts. After all, the only thing worse than having no presence is having poorly-managed social media profiles. The implications can be widespread and potentially damaging to an organization’s reputation. Managing social media for companies effectively depends on focused efforts on strategically chosen platforms. Don’t worry, we’ve simplified the legwork for you. Read on for your five-step guide to finding the right social media site(s) for you. That’s a key consideration when developing your social media business strategy. You can determine which social media platforms your target market is actively using in a number of ways. It seems so simple, doesn’t it? You can survey your existing customers, clients and contacts by using one of the online free survey sites, or by polling them via your email list. Or, you can simply ask them when they enter your brick-and-mortar business or at checkout online. Social media demographics are widely available online, and the data is robust. You’ll want to know the demographics for your current clients and the target markets you wish to reach. Information like age, gender, income and education can be helpful in your decision-making process. In “Social Media Demographics to Inform a Better Segmentation Strategy,” Michael Patterson says in-depth information is available about market demographics for many of the popular sites: Facebook, Twitter, Instagram, Google+, LinkedIn, Pinterest® and Snapchat. Use that data to determine where the majority of users live, their income levels, their gender and much more. From there, you will be able to glean insight into which platforms your target markets are most likely using, and which social media sites for business are right for you. “For instance, if you’re primarily targeting women over 50 years old, Instagram probably isn’t the best option. You’re better off with Facebook or Pinterest,” Jackson says. Find where your content, or similar content, is already being shared. Even if you aren’t on social media, chances are your name is there. Consider logging on to various sites and searching for your company name, related product lines, competitor accounts or areas of interest among your target audiences. Look for places where that conversation is happening: your target audience has a presence there that you can work with. As a bonus, you may also learn what your audience thinks of your business, what they wish you would consider tweaking, what they love about your products and services, and even how your staff is performing from a customer service standpoint. Jackpot! Lastly, consider which social media sites are already driving traffic to your business. You can do this with the help of Google Analytics™. Jackson suggests checking out the data under Acquisition. Then choose Social and Network Referrals. You know it. We know it. Everyone knows it. Resources—both time and money—are limited. Obviously, managing both wisely is important, especially when considering your social media strategy. So the question is: what is your team capable of doing within budget and scheduling limitations? It goes without saying—poorly-used resources could result in a very low return on your efforts. Spread your time and staff too thin and your audience engagement could suffer. A single person with an existing full-time load of responsibilities likely won’t be as responsive as your social media audience would like. And at its core, that’s the point of social media: it’s a conversation, and it’s about building relationships. If it’s a one-sided conversation and customers can’t reach you, you may send the message that your business is not interested in providing excellent customer service. Customers have become accustomed to nearly immediate responses and online customer support with a real person on-demand. In “6 Social Media Trends That Will Take Over 2016” Jennifer Beese said, “Social media thrives on real-time engagement, but each year the window for response becomes smaller and smaller.” According to Search Engine Watch, 70 percent of Twitter users expect a response and 53 percent want a response in less than an hour. That jumps to 72 percent when they have a complaint. Allocating the right resources to the right platforms is essential. No one wants to wake up to negative reviews of their company. Make sure you have enough staff to stay on top of issues and address concerns. In 2014, consumers took to social media to complain about brands 879 million times, according to www.sproutsocial.com. Worse, the majority of those messages went unanswered, even after three days. The good news is that there are tools out there that can help. Automation and social listening tools can help you streamline your efforts and provide useful data to hone your strategy. Overall, they can help make the most of the time and money you devote to social media. The bottom line: by strategically choosing your platforms and taking time to calculate what you can realistically do with your resources, you can maximize your return on investment (ROI) and delight your customers when they engage with you on social media. So far, you’ve considered how much of your staff and financial resources you can dedicate to your social media strategy. But don’t stop there. It’s vital to consider your strengths. Each social media platform has a unique set of capabilities, and some will be more applicable to your business than others. For example, if you run a professional photography school or an art studio, photo sharing sites like Instagram would provide a great platform to showcase the visual aspects of your business. If you provide drone videography services, you may find sites like YouTube® work better. Look at each channel and consider how they will work with your business. In “How to Choose the Best Social Media Platform for Your Business,” author and online marketing expert Scott Levy suggests, “When it comes to choosing which social media platforms you’ll utilize, select those that offer the best potential for reaching your ideal audience and broadcast the type of media you’ve decided is best suited for your company.” When it comes to selecting social media sites for businesses that are large, or social media for small business, most companies don’t have the resources to be successful on every platform. So, instead of having lackluster representation in a lot of places, be amazing on a few of them. Here are some popular platforms and the type of content they work best with, according to Levy. According to Levy, LinkedIn is great for connecting people, engaging in group discussions about specific interests and showcasing your expertise. LinkedIn is also a popular publishing platform. It is a great option to get exposure for your original content, and to position yourself as an expert in your industry. This platform provides a continuous real-time conversation in short, text message-like posts. It’s ideal for companies that want real-time engagement with their audience and are willing to put in the effort to maintain it. “If you have breaking news, updates, questions for your followers, or if you want opinions now or even need to announce a recall, Twitter is the way to reach out to people,” Levy said. As you can see, the type of content you want to share has a big role in choosing the right social media platforms. Depending on the size and scope of your business, going for the most popular platforms could be a valid choice. But social media is about more than the number of users. It’s important to remember that the bigger the site, the more competition you face. A social media campaign that could easily get lost on a popular site could gain real traction on a niche site. So when you’re considering platforms, dig deep. It may require a little legwork, but you could see a huge payoff in market saturation. Here’s how to go about it according to Patel. Consider what Patel calls the lesser three: Pinterest, Instagram and YouTube. You may also want to consider location-based sites, such as Foursquare® and Yelp®, particularly if you have a brick-and-mortar presence. Consider even smaller sites. Patel clarifies that these sites are still massive, but they appeal to people who have shared interests. These sites include Tumblr®, StumbleUpon® and Reddit®. Lastly, explore niche sites. A social network that is specifically created for your target market may provide more return on your investment of time and energy. How do you find the right niche social site? Patel recommends simply putting your keywords, along with the words “social network,” in a search engine to see what’s out there. Niche sites won’t have the big user numbers that Facebook has, but you’ll get a more accurate sample of your target market when you find the right group. Hyper-relevant content rules. Users are beginning to prefer in-the-moment content, and most platforms sort posts by relevance. That means better posts get better play. Live streaming is gaining momentum. Video has been increasingly popular on social media, but these days, users want more. With the advent of Facebook Live, chances are, demand for live-streaming content will only increase. Social interaction is changing. New types of interaction are emerging, including one-sided conversations on Snapchat and applications like Messenger for Business on Facebook, aimed at customer service. The range of options is constantly growing and new capabilities are emerging. Staying on top of this can put your business on the cusp of the next big thing. A more personalized experience. As we mentioned, users want content that is relevant. Social media platforms have heard the demands for customization, and they’re doing their best to meet those demands. Social media apps are trying to keep people in-app for as long as possible by offering greater functionality. Experts say this trend will increase as it relates directly to app revenue. “Some of these functions include in-app search functions, embedded content, and in Facebook’s case, even a personal digital assistant,” DeMers says. Savvy marketers don’t have to adopt all of them, he says, but will want to recognize that broader app functionality is a trend that will likely shape the future of social media marketing. So, there you have it: five steps to finding the right social media sites for business. Once selected, you’re well on your way to discovering success in user engagement, sales conversions and brand loyalty. Remember, you don’t have to do all platforms well; the key is to select the platforms that work best for your business. Focus on communicating effectively. In time, armed with a thoughtfully-developed strategy, your business can experience measurable ROI, improved customer relationships, and business growth through the power of social media.